Even though Moss can be pretty feature growing in between brick paths or adding character to the already beautiful forests of Oregon, the one place Moss should never be is on your roof or high traffic walkways. Besides the fact that Moss on your roof isn’t the prettiest site in the world, there are a lot of other reasons why it shouldn’t be there. Moss, if left alone to grow, will diminish the life of your roof and may even result in needing to have your house re-roofed. 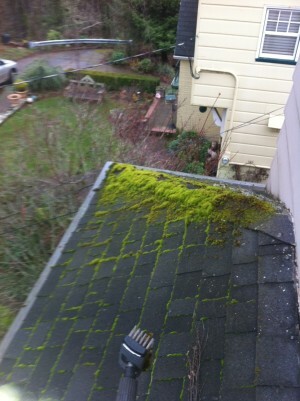 1) The first reason Portland OR Moss Removal is needed is as moss grows on your roof it tethers itself to the shingles, even growing under them. When this happens, it loosens them and when the windy seasons come around there is a very high chance pieces of your roof will go with it. 2) The second reason you need Portland OR Moss Removal is since moss pushes up the shingles as it grow, water will start to go under them instead of rolling down off your roof and into your gutters. This can cause roof leaks and lead to water damage in your attic and ceilings which will get costly when repairs are needed. 3) Moss unlike some other ground cover holds in moisture. Having this on high traffic areas means a slip and fall incident since Moss is wet and very very slick. Not only that but since is retains water, during winter and colder seasons the moss will freeze and as we all know as water freezes, it expands. If you have moss on your roof, as the year goes by, the freezing and then the thawing of the water in the moss will cause the little granules on the shingles to fall off as well as weakening the hold of the shingles to your roof. Once you lose the granules, the lasting power of your roof depreciates. 4) The last reason you may need to look into Portland, OR Moss Removal is if you’re selling your home. If you’re wanting to sell your house or renew your home insurance policy, you may not be able to if you have a moss problem. This again just proves the point that moss can depreciate the value of your home and give you a big headache down the road. These were just four reasons as to why moss should be taken care of before things get out of hand. 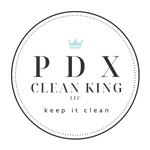 We offer Portland, OR Moss Removal and Portland, Oregon Roof Cleaning in the Portland/Multnomah County area. So if you have questions or concerns about Moss Removal on your property give us a call or email us and we’ll come out for a FREE Portland Moss Removal Estimate and Inspection. We offer other services besides Portland Oregon Moss Removal, check them out!